The Windham, New York based balladeers are celebrating their seventeenth year and over 350 concert performaces. They are dedicated to preserving the songs, tunes, history and spirit of the Antebellum and Civil War period. The 1860s left a heritage of songs and melodies that reflects one of the most turbulent times in American history in the most vivid way. These truly were the �Heart Songs�� of America. The band uses the original music arrangements and lyrics to convey, emote and capture how our ancestors talked, their rhythms, accents, beliefs, their spirituality, motives and patriotism. The City of Hudson, New York newspaper Register Star praised these modern day troubadours in their editorial column saying, �these re-enactors not only entertain but they also teach history lessons with their music.� The 77th New York Regimental Balladeers have been recognized by the United States Department of the Interior, Gettysburg National Military Park for their outstanding and authentic portrayal of the music of the period. The original 77th New York Regimental band was comprised of military personnel from Fulton, Essex and Saratoga Counties who fought in the Civil War. The group banded together in 1872 as part of the Survivors Association of the Seventy-Seventh Regiment, New York State Infantry Volunteers of 1861-65. These heralded musicians kept alive the memories and spirit of comradeship they had experienced together during the war. A military note was dominant in many social events of the period and the musical troupe was foremost in every event given for the interest and betterment of the community. The 77th New York Regimental band flourished into the early 1900s, when thinning ranks as members answered the final taps, caused it to dissolve. For more than 25 years, the Seventy-Seventh Regiment band was a musical organization well thought of in the Capital District and North Country region. The balladeers are honored to evoke the memory of the �Old� 77th Regiment band and are proud to keep their spirited musical tradition alive. The balladeers� ��Rally Round the Flag� CD project was dedicated to and helped raise funds to support the preservation of New York State�s Civil War Battle Flags. The members of the group perform with fiddles, guitars, banjos, harmonicas, tin whistles, harp, bodhran, bones, bass, trumpet and dulcimer. The troupe performs regularly at encampments, museums, schools, colleges, historic sites, private parties, weddings, conferences and other living history events. Band members include John and Sharon Quinn, Bill and Barbara Lonecke, Jim Broden, Gisella Montanez-Case, Joyce Cockerham, Jennifer Brylinski, Frank and John Swarthout, Ray Smith, John Kenosian, Steve Gubler, Gus Truin, Ron Burch and Peter Krug. They are honored to recreate the musical landscape of mid-nineteenth century America. The group was recently awarded the Medallion of Excellence by the Rhode Island National Guard for their music of the Irish during the American Civil War concert program. The balladeers are the host unit for the annual Civil War Heritage Music Gathering & Encampment. This event, which is held on the first weekend of August each year, is considered to be one of the premiere living history events of its kind in the northeast. John co-founded the 77th New York Regimental Balladeers three years ago. 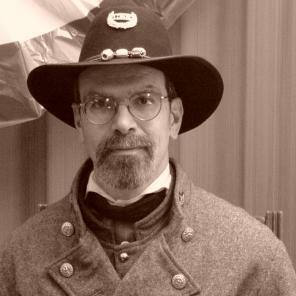 Mr. Quinn is a noted Civil War historian, collector of militaria and performer of songs of the period. He served as historical consultant and authored the chapter introductions for the book, A War to Petrify the Heart: The Civil War Letters of a Dutchess County Volunteer, Richard T. Van Wyck. Several Letters included in the album are from John's collection of Civil War correspondence between soldiers and the home front. He has appeared on television, radio and at schools, historical societies, colleges, teacher conferences, and Civil War roundtables to discuss the penetrating first-hand accounts of the events documented in soldiers' and civilians' writings and journals from 1860-65. On Somebody's Darling John sings lead vocals and plays guitar, six-string banjo and mandolin. His rendition of Minstrel Boy, an early 1800s Irish classic, has won rave reviews and moved audiences wherever it has been performed. He resides in Windham, New York, with his wife Sharon who developed the concept for the album's cover. Sharon has taught in the Catskill Central School District for 31 years. Her art classes integrate Civil War history and the arts. Sharon produces and choreographs the Tenting Tonight visual arts program with the Balladeers' music. She is a collector of carte de visites of women in period fashions. She has incorporated these images in her unique and highly sought after handcrafted note cards and miniatures. These items are usually for sale at each performance. She resides in Windham, New York with her husband John and their Golden Retriever, Lincoln. 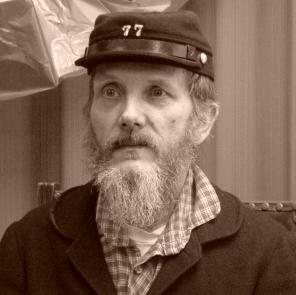 John joined the 77th New York Regimental Balladeers in the spring of 1997. 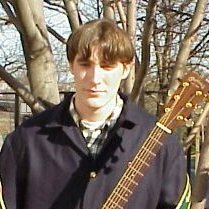 John plays mandolin, guitar, and acoustic bass for the Balladeers. This will be his third season with the group. When not with the Balladeers, John is very busy in the music scene. He currently performs and records with several groups playing anything from Celtic, funk, metal, to jazz. John also is a resident musician with the Compass Rose Theatre Company of Astoria. He is busy assembling a swing band, reminiscent of Django Reinhardt's Hot Club of Paris, for their upcoming summer production of "Much Ado Bout Nothing". He made his theatre debut last summer in the company's production of "As You like It", and also arranged and composed the music for their production of "A Winter's Tail". On top of all of this, John goes to college where he is studying music and also spends his winters coaching youth hockey. This is Gisella's first season with the Balladeers. The extraordinary range, power and passion of her singing voice are appreciated wherever we have performed. Her beautiful voice, combined with her dramatic flair makes every concert appearance a special treat for the audience. Prior to her operatic work, she performed in operettas and musicals, touring the United States and Scandinavia in Evita with Director Hal Prince, and performing Dolly in Three Penny Opera. She has been a Semi-Finalist in the Metropolitan Opera Awards. Gisella has attended Chicago's American Conservatory of Music. The following quote from the Grand Rapids Press says it all: "The remarkable voice of Gisella Montanez-Case, a soprano makes one's hair stand on end. Here is a voice of extraordinary range and color to say nothing of power - power that is delivered without forcing or distortion of pitch. Not only does she have one of the most beautiful voices around here, she also has an innate sense of phrasing, a knowledge of how to round off a phrase so the listener never is quite sure when the note is ended." Whether singing a patriotic song like The Battle Cry of Freedom or the sentimental ballad Aura Lea, Gisella's love, respect and heart-felt passion for the music of the Antebellum and Civil War periods comes through during every performance. We know you will enjoy her marvelous singing talent. Ms. Montanez-Case resides in Glens Falls, NY with her husband Paul, their son William and dog "Cookie". Jim, a native of Albany, New York, learned to play the violin in public school. While serving in the United States Navy, Jim continued to pursue violin, piano and flat pick guitar. After retiring from the Navy with twenty years of service, Jim began to focus on his true calling � playing fiddle tunes. Jim describes fiddling as a form of "wordless communication." To him, playing a thirty-two bar solo set is like telling a story. The musical story might be sad, aristocratic, or funny, depending on the tune. According to Broden, "when playing at a contra-dance his fiddle talks to the dancers and their dance movements act as a reply." Jim has been playing with the 77th New York Regimental Balladeers since they initiated their highly praised concert series in the spring of 1998. On Somebody's Darling and Shenandoah, Jim supplies a rich instrumental harmony to enhance and blend with the vocal arrangements. Mr. Broden resides in Schenectady, New York. Bill brought his tenor banjo talents to the Balladeers six months ago. He is an avid living history participant and a highly dedicated social studies teacher. He has been playing tenor banjo since the eighth grade. Bill started playing the cello in Junior High School on Staten Island, New York. According to Bill, the transiton from cello to the tenor banjo was fairly comfortable since the finger positions and tunings are the same. Bill's lively and melodic banjo picking adds much to the Balladeers' music. He's also a writer of Civil War non-fiction. His book "A War for Love" is available at our concerts. Mr. Lonecke, his wife Barbara, sons Jason and Justin and their daughter, Cindy reside in the tiny hamlet of Maplecrest, New York located in the heart of the Great Northern Catskill mountains. The Lonecke's are also members of the Civil War Heritage Foundation (CWHF). Its purpose is to educate the public about our American Heritage. You'll usually find the entire family at an encampment or living history event portraying Civil War personalities in the first person. Bill is very approachable and is always eager to share his passion for the history of this period with our concert audience.